Our goal is to celebrate all that is beautiful, natural and pure—and inspire us to live a more natural life. We want 1 Hotels to be the experience that encourages people to live well, do better, and connect with our environment, ourselves, and others in a deeper, richer way. The concept of 1 Hotels was built off a simple idea; the world around us is beautiful and we want to keep it that way. 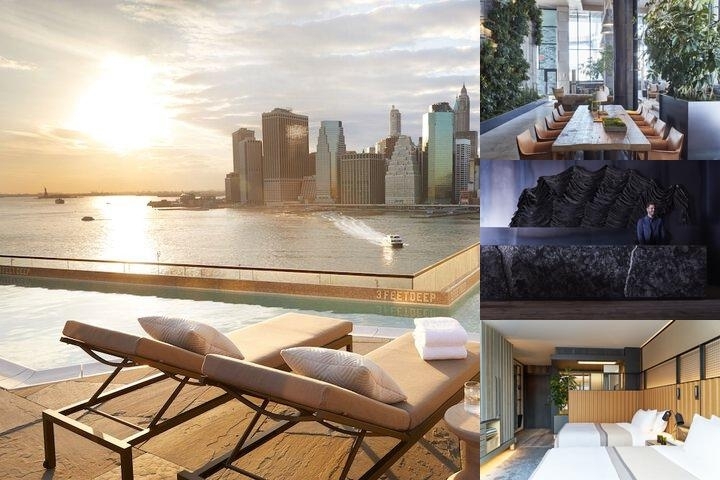 1 Hotel Brooklyn Bridge has been designed to highlight the beauty of nature, combining eco-friendly luxury designs and an unrivaled level of service. With its unparalleled location, on the Brooklyn Bridge Park waterfront, guests will experience unobstructed views of the East River and Manhattan Skyline. 1 Hotel Brooklyn Bridge is unique in its 29 suites that can flow into a six-bedroom suite when needed, 24 hour in-room dining, state of the art fitness, a full Spa curated by Lady Bamford, 50 seat screening room, and private meeting areas filled with natural light. 1 Hotels is luxury with a conscious. We believe in "green" moments throughout our hotel, whenever possible. We've eliminated plastic bottles from our property completely and equipped guestrooms with triple filtered water systems. We've also utilized reclaimed wood throughout our entire building design. We will also have systems in place to collect rainwater and a composting program in place to give a second life used items. Our outdoor pool is located on our rooftop. Hours of operation have not been finalized yet. Individual rooms may be cancelled up to 24 hours prior to arrival. There is a penalty of 1 night charge for cancellations within 24 hours. Pets up to 35lbs are permitted. Breakfast is not included but is available through our restaurant which is helmed by critically acclaimed Chef Seamus Mullen. Our restaurant offers local and seasonal cuisine showcasing market-fresh, local and organic ingredients and purveyors. Below are the meeting, banquet, conference and event spaces at 1 Hotel Brooklyn Bridge. Feel free to use the 1 Hotel Brooklyn Bridge meeting space capacities chart below to help in your event planning. Hotel Planner specializes in Brooklyn event planning for sleeping rooms and meeting space for corporate events, weddings, parties, conventions, negotiated rates and trade shows. 109 x 50 x 12 Ft.
80 x 25 x 12 Ft.